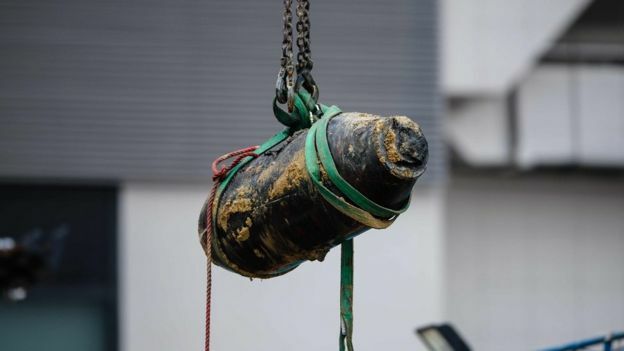 Hong Kong police have successfully defused a “severely damaged” World War Two bomb that was found at a construction site in a busy commercial area. 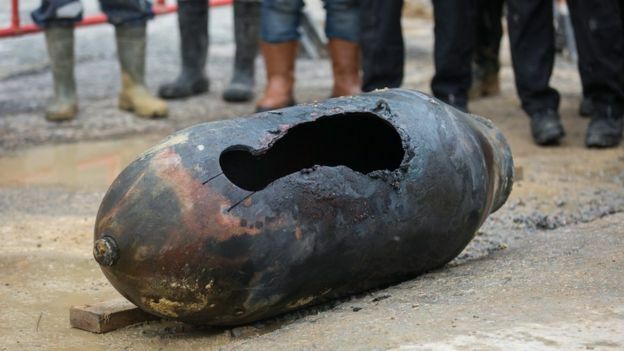 Over 4,000 people were forced to evacuate and streets cordoned off as experts worked overnight to disarm the 450kg (992lbs) wartime bomb. The bomb is the second to be found in Hong Kong within a week. 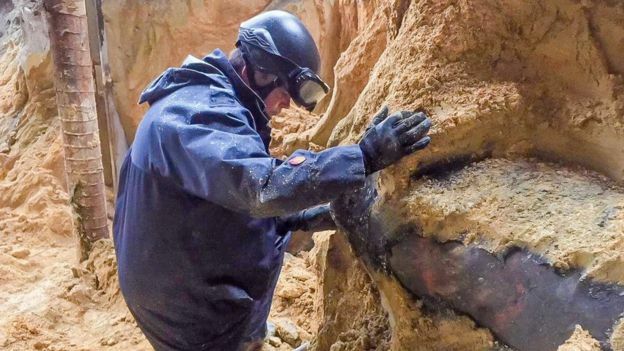 It is not uncommon for unexploded WW2 bombs to be found in the territory. 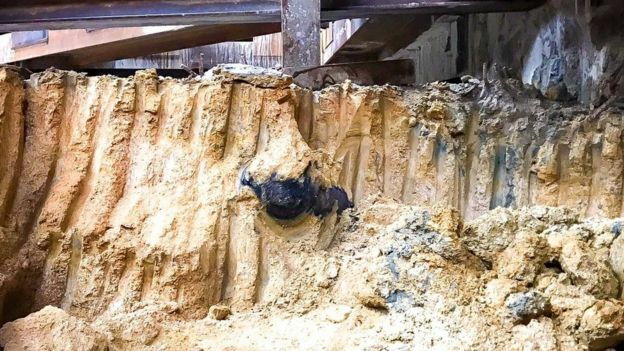 The bomb was found embedded in the ground of a construction site in the busy district of Wan Chai on Wednesday. Police sealed off parts of the district and suspended ferry services across Victoria Harbour as the operation took place. 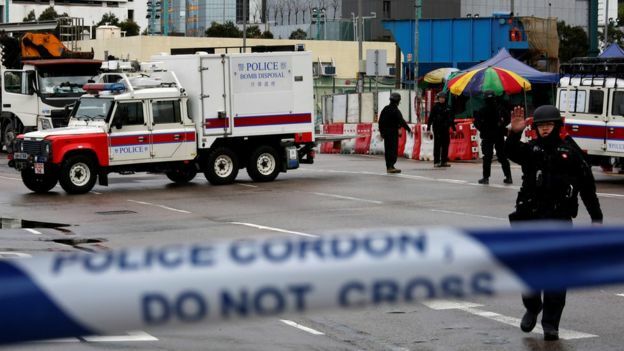 The bomb’s fuse mechanism was found to be “severely damaged”, and the position of the bomb made it hard for equipment to reach it, bomb disposal officer Alick Whirter told the South China Morning Post. 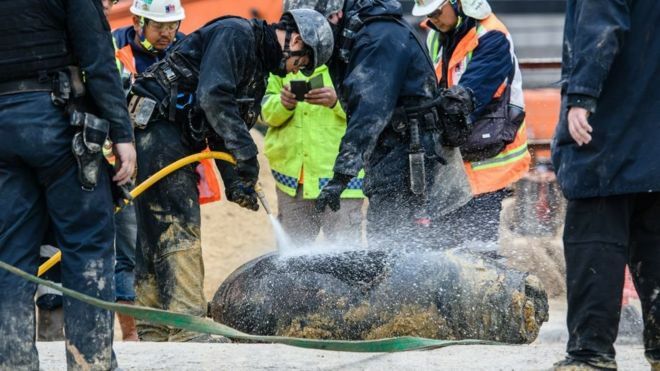 At about 08:00 local time (00:00 GMT) on Thursday, Explosive Ordnance Disposal officers cut a large hole through the bomb’s shell to burn off the explosive material inside. After the gunpowder in the bomb burned up, it was lifted off the site by crane. “Bomb disposal operations are dirty, difficult and dangerous. In this particular case, all three were true,” Mr McWhirter told the SCMP. The entire operation lasted about 24 hours. All buildings in the area were eventually allowed to reopen by 11:00 local time, and roadblocks were lifted by noon. A bomb of the same size was found earlier this week at the same site and defused on Saturday. Both bombs weighed 450kg each and were confirmed to be US-made AN-M65 explosives. Bombs and unexploded grenades have been found in Hong Kong before. The city, which was occupied by Japan between 1941-1945, was bombed by allied forces while under Japanese occupation. The heaviest bomb to be found in the city was a 907kg (2,000lbs) wartime bomb that was defused in 2014.